Evan Revenel scored 21 points and 10 rebounds in Sunday’s hard fought game. 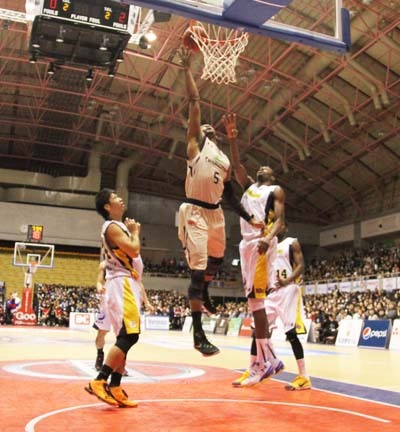 On Saturday, the Ryukyu Golden Kings scored a solid 77-65 victory against the Takamatsu Five Arrows at Okinawa City Gym in front of 3,728 fans. The win also meant that the team secured a place in the season’s play-offs. 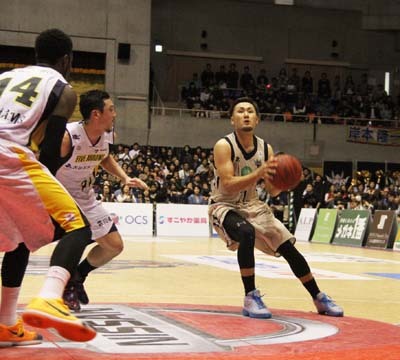 Shuhei Kitagawa had a 27-point game on Sunday that included five 3-pointers. The start of the Saturday game was not very promising as the Kings kept making mistakes and did not get into groove and smooth flow of the game as they succeeded to sink only about a quarter of their attempts in the first quarter. Their difficulties in shooting continued throughout the first half of the game, and the score was even 30-30 at halftime. In the beginning of the third quarter starting with Burns’ three point shots, the Kings scored 12 points in a row, and managed to pull away from Takamatsu. 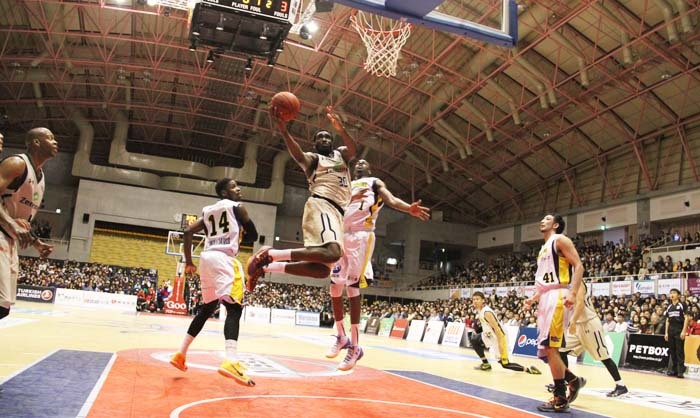 They extended their lead with a successful run-and-gun play in the fourth quarter and secured the victory. Ryuichi Kishimoto shot 19 points. After the game, the Kings’ Head Coach Tsutomu Isa admitted that his team had some problems in the beginning. “We were too passive in offense in the first half of the game. So we decided not to hesitate to attack in the latter half of the game, and our players did respond to the expectations without making mistakes. We gradually managed to draw Takamatsu into our pace, and each of our players performed to the fullest of their abilities,” Isa stated. Takamatsu’s bench boss Hiromichi Tsuda admitted that his team did not have the energy to win the game. “Our players did a good job in defense until the middle of the third quarter but could not make shots in the important situations. Our defense weakened towards the end. We wanted to score about 80 points in this game but did not have energy left in our legs because of our aggressive offense earlier,” Tsuda lamented. On Sunday, the Kings needed overtime to earn a hard-fought victory. The final score was 106-97 for the Kings. 3,430 fans came to watch the game. Athony McHenry showing how it’s done. 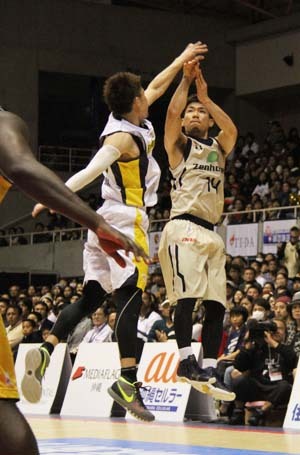 Shuhei Kitagawa was the anchor of the Kings’ strong offense scoring 27 points, including five three-pointers. Evan Ravenel also had a good day with 21 points and 10 rebounds. The Kings took the initiative in the first quarter, and were able to control the pace, but had a hard time to score in the second quarter as Takamatsu refused to give up. The Kings allowed Takamatsu rebound and temporally turn the game. The seesaw struggle between the teams continues in the third quarter. 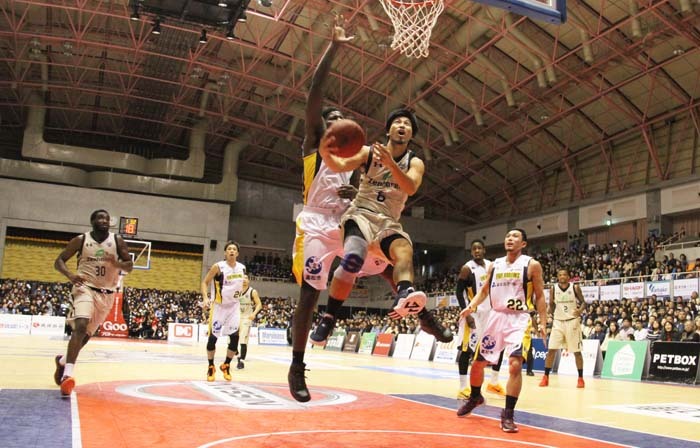 The game was reversed again in the fourth with Takamatsu taking the lead, but with four seconds to go, Kishimoto sank three free throws to even the score, and the game went into overtime energizing the Kings who continued to attack the hoop were able to pull clear from Takamatsu. King’s bench boss Isa was happy after the game. 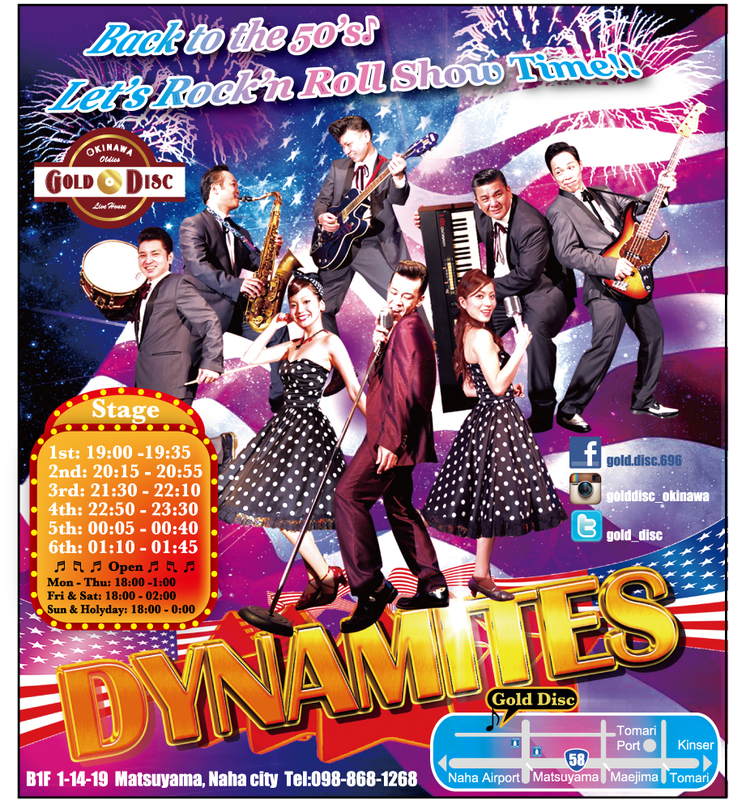 “We showed a passion for the victory more than Takamatsu. We used to lose games before if we were in a situation like this. Although we still have a lot of tasks to do, it was a big thing for us to win the game today. We expect to have a tough game with Takamatsu next time, so we will prepare well. Shigeyuki Kinjo put in a day’s work with 8 points.